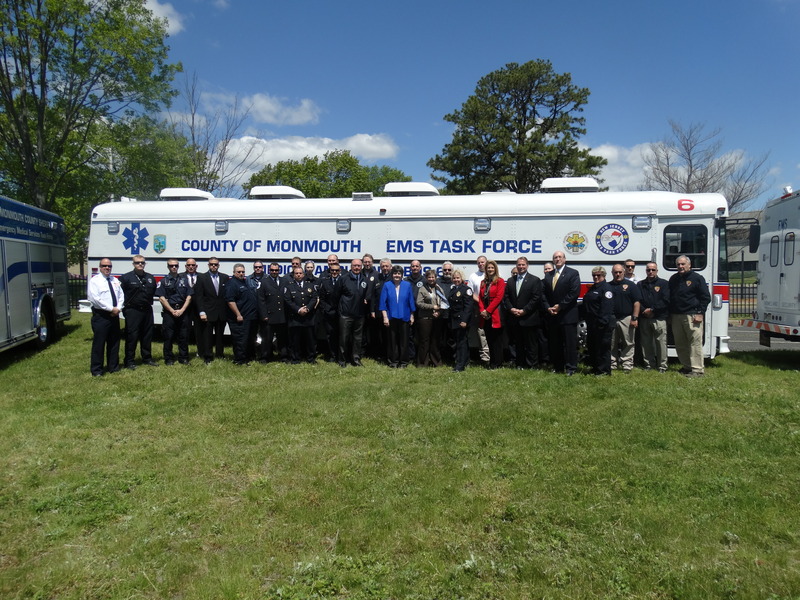 Neptune: Sheriff Shaun Golden is pleased to announce a partnership with the Monmouth County Sheriff’s Office, NJ EMS Task Force, Neptune Township and the NJ Department of Health during National EMS Week. After some time in the making, the New Jersey EMS Task Force, now, has a long awaited place to call home at an operations center in Neptune. The task force is a statewide disaster response and emergency planning organization, made up of individual and specialty members from both career and volunteer EMS providers. The new Sheriff’s Emergency Medical Training Center, which serves as a backup 9-1-1 Communications Center, located on Route 33 in Neptune will also provide EMTs with an opportunity to train on EMS special operations vehicles and emergency equipment including the Medical Ambulance Bus, (MAB). The MAB is a vehicle designed to provide mass casualty incident response and transport, medical evacuations, on site triage, firefighter and EMS rehabilitation and medical support for long term emergency incidents. The NJ EMS Task is run through NJ Department of Health. It supports emergency response operations at major incidents and planned events throughout the state and region. The task force includes mass care, hazmat team and communications and technology specialists plus provides incident management to areas in need. Neptune Township currently owns the 50,000 square foot facility which Monmouth County presently leases. It has been utilized for sheriff’s office operations.